40 is fullcourt man-to-man defence without trapping, 42 has trapping. For a progression, see Defence - Match-up press. - down late in a game, try for 5-second counts and steals, the press stays on (42 tough). Deny an inbounds pass except to 1, who is pushed toward the baseline by X1. 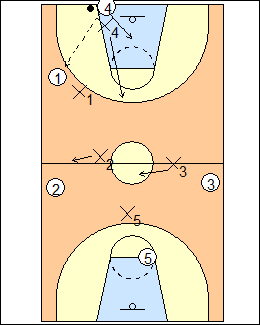 X4 defends the inbounds passer, drops to the line of the ball on an inbounds pass, then it's basic fullcourt pressure, without trapping, X4 is the help to contain the ball. Morgan Wootten - X1 turns the dribbler, nose on the ball. Canada Basketball - good presses must influence the ball in specific directions [e.g. sideline, or weak hand]. Doug Porter - On press - low-post X5 is up front so they can transition to offence quickly, he pressures the inbounder (is the xinbounder), other defenders match up. Vance Walberg - when the ball is in an outside quarter of the court, all defenders are in that half, when the ball is in an inside quarter, all defenders are in the two inside quarters. Don't hug your man, play on the high side (up the line). Avery Johnson - don't get in front of your man and invite an overhead pass, no long passes. See Defences - Morgan Wootten fullcourt, George Mason Scramble fullcourt, also Mavs fullcourt, 2-2-1 Vance Walberg. To deny an inbounds pass to a strong point guard, X4 double teams with X1. X4 face guards but gaps, X1 plays 3/4 from the middle, not allowing a pass over the top. On an inbounds pass to another attacker, X4 recovers to 4 (line of the ball) and X1 denies 1. If 1 inbounds the ball, go 40 On, X1 defends the inbounds passer then denies a return pass. Morgan Wootten - X4 plays between the ball and 1, X1 plays behind and ballside, completing the double team. George Mason - twist - as the ball is taken out by 4, X4 double teams by face guarding 1. Twist is great after a time-out, and a terrific way to get a 5-second violation. Bob Hurley - against a team that runs on made field goals, instead of guarding the inbounder, double the outlet, forcing him to go back for the inbounds pass, you've taken away the break. Doug Porter - Off press - xinbounder double-teams the best ballhandler to force the ball to other players, or against a 1-up press break. See Defences - Morgan Wootten (shortstop), George Mason Scramble (twist). X4 drops off the inbounds passer, playing in a rover position behind the primary receivers, X1 and X3 deny, trying for a 5-second count. Morgan Wootten - centerfield - X4 plays at or above the top of the circle, cheating ballside, X1 and X3 can be even more determined about overplaying because a lob is covered. 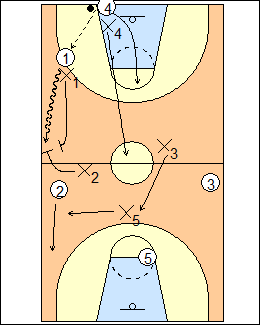 Jim O'Brien - the black press is used after a made perimeter shot or on a dead ball, instead of pressuring the inbounder, X4 supports behind the front line of the press. See Defences - Morgan Wootten (centerfield), White and Black (black), Hoop Tactics (shadow), also 1-2-1-1 Kentucky (black). X4 immediately traps on a ballside inbounds pass below the block (or below the foul-line extended). 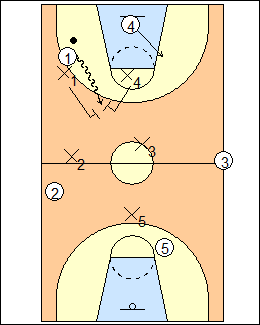 Billy Donovan - an inbounds pass ballside below the block is an automatic trap by X4. George Mason - the short corner is the trapping area, It's one trap then back if the press is broken. Doug Porter - xinbounder pressures the inbounder then looks to trap first pass. 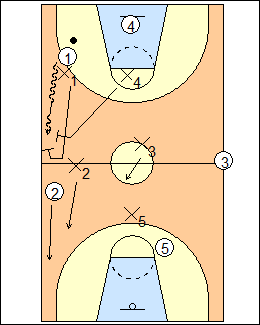 Jim O'Brien - the white press is usually used after a score from inside the lane, X4 pressures the inbounder and immediately traps an inbounds pass to the coffin corner. Billy Tubbs - trapping is normally optional but can be required, if you don't trap the inbounds pass they will clear out. See Defences - White and Black (white), Florida match-up, George Mason Scramble (quick trap), Morgan Wootten (fist and fingers), Billy Tubbs, Kentucky, Hoop Tactics (blitz trap). The only pass not denied is backwards, all defenders are below ball level. Get the ball out of the point guard's hands, X1 denies a return pass, X4 recovers to 4. Billy Donovan - X3 may be able to steal a pass back to 4, but don't give 3 the middle of the floor. Walberg - X3 looks to pick off a reversal pass if the trailer leaks up the middle, but can't get to it if 4 stays way back. Good players move on the pass, great players move on the pivot and sprint on the pass. Doug Porter - against a 1-up press break it is almost impossible to cover a return pass to the inbounder with rotations. 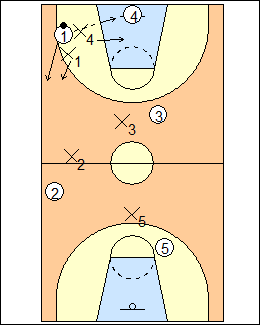 After the inbounds pass, trap X1 off the dribble, a) X4 is the designated trapper, or b) trap with the nearest defender in the direction of the dribble. After the inbounds pass, X4 gets to ball level and at some point traps with X1, he can hit immediately on the pass. George Mason - slow trap - X1 forces 1 to the middle, herding with X4 until a trap is formed, if 1 passes to 4, X1 denies a return pass. X4 is the official trapper, if he thinks he can trap a dribbler before halfcourt, especially secondary ballhandlers. Walberg - they don't care which way you force, X4 always turns into a trapper, he runs to trap if 1 drives up the sideline or the middle. Here if 1 passes in the air off the dribble to 4, X1 runs and jumps (switches to 4, shown); if 1 stops, trap him. See Defences - Mavs fullcourt, George Mason Scramble (slow trap), 2-2-1 Walberg, Versoix (trap with X4, one and done). Here 1 drives up the sideline, X1 turns him (takes away the sideline) and X4 traps from the side. Option - X1 stays on the side and X4 traps from the front, e.g. if X4 is a rover, see 42 Tough. Walberg - X4 runs to trap when 1 drives up the sideline, X1 has to turn 1 and X4 traps from the side. In a trap, don't foul, and don't get split. Hoop Tactics - X1 forces sideline, rover X4 traps from the front. 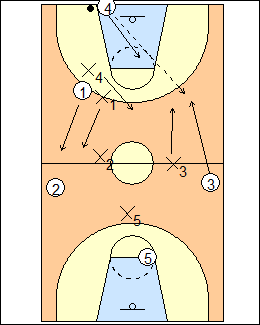 Shaka Smart - trap the turn - X1 and X4 are going to trap, X1 takes 1 to the sideline and turns him back, X4 has to go trap once he sees the back of 1's head. Chris Oliver - force the ball sideline then turn it back middle, trap by leaving the offensive player who clears out last, rotate to deny the ballside wing, the middle or reversal, and the basket. 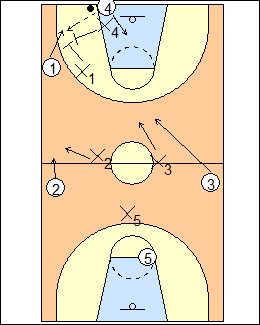 See Defences - Havoc double-fist, Hoop Tactics (shadow trap), also 2-2-1 Kimble ("in" stunt). Trap in the direction of the dribble - if 1 drives up the sideline, X2 traps with X1 (run and trap from the front). Jim O'Brien - trap with the nearest defender in the direction of the dribble, rotations are mostly instinctive, X3 or X5 can cover 2 (the obvious pass), X4 takes away a pass to the middle, the only pass not denied is backwards, all defenders are below ball level. Morgan Wootten - blitz trap - X1 can force 1 to the sideline for a trap with X2, or to the middle for a trap with X4. Billy Donovan - X1 is not forcing side or middle, when the ball gets even with the top of the circle, another defender runs up to trap, don't allow other teams to just clear them out (also see Defences - Maryland, Kentucky). Get the ball away from the point guard, make it hard to get back. Carleton Ravens - if 1 is left-handed, X2 traps from the front and X1 takes away middle, keeping the ball on the weak hand. If 1 is right-handed, X1 turns 1 and X4 traps from the side. 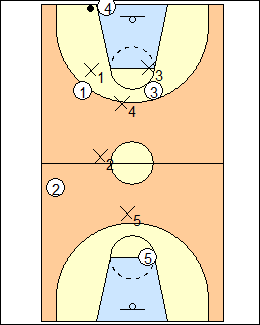 Shaka Smart - VCU doesn't do this as much because most teams are smart enough to stretch 2, and the guy who has to rotate (X5) is their slowest guy. 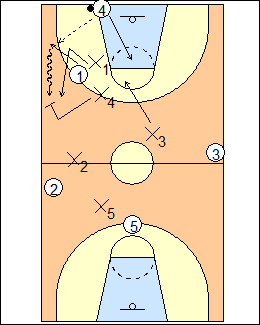 See Defence - 1-2-1-1 Thumbs up, also 2-2-1 UConn, 2-2-1 Kimble ("out" stunt). Deny the inbounds pass, look for a 5-second count. Try for steals, a defender looks to shoot the gap to contest a pass to the trailer out of a trap, and the press stays on for any backward pass, or keep trapping on any perimeter pass, the press is broken on a gut pass or penetrating dribble. Jim O'Brien - deny the inbounds pass, the press stays on for any backward pass. Morgan Wootten - deny passes all over the court, needed when trailing at the end of a game to force a turnover. On a trap, take away a pass back to the inbounder. Avery Johnson - depending on time, score and spacing, a defender may be able to full rotate for a steal out of a trap, inviting a pass to the furthest attacker. Dean Smith - double-team until the ball penetrates past the hash marks in their backcourt, then sprint back, talk, pick up their men. Billy Donovan - if the ball is dribbled over halfcourt with no trap, the press is off, sprint to get a man. See Defences - 1-2-1-1 Basics (keep trapping on a perimeter pass, the press is broken on a gut pass or penetrating dribble), Tar Heels scramble (32, trap on the first dribble in the backcourt).